… it is quite difficult to win their trust. Berlin, German–bistreamUG, the leading accelerator to bridge Japanese and Germany business, is excited to announce this partnership with the Japan External Trade Organisation (JETRO), the Japanese governmental organisation. 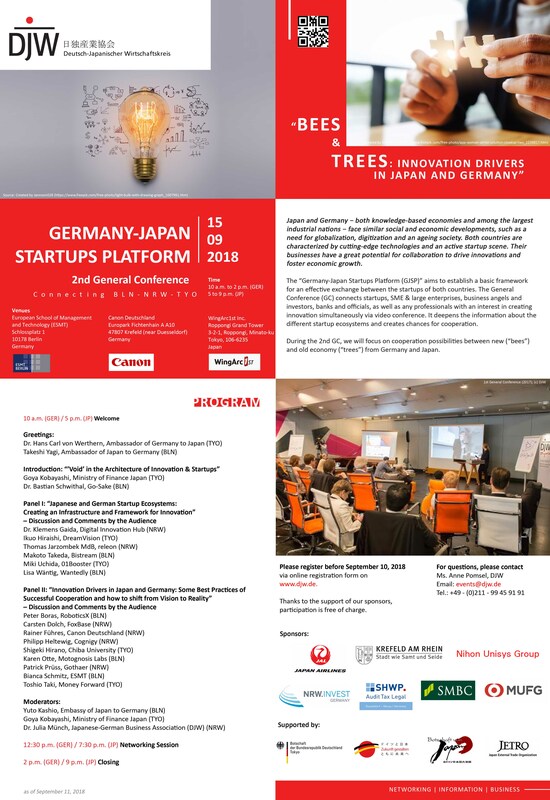 As part of the partnership, bistreamUG provides extended support for German startups to expand their market to Japan by connecting them with bistreamUG’s extensive networks and resources in Japan, and for Japanese startups to the ons in Germany. Please apply for our support through the JETRO Global Acceleration Hub Portal here! You can find the updates from Hubs on their Facebook page. JETRO, or the Japan External Trade Organization, is a governmental organisation that works to promote mutual trade and investment between Japan and the rest of the world. Originally established in 1958 to promote Japanese exports abroad, JETRO’s core focus in the 21st century has shifted toward promoting foreign direct investment into Japan and helping small to medium size Japanese firms maximise their global export potential.